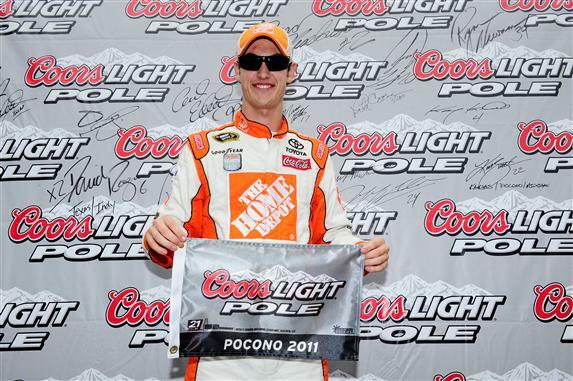 Taking his second pole of the season, Joe Gibbs Racing driver Joey Logano will lead the 43-car NASCAR Sprint Cup field to green for Sunday's Good Sam RV Insurance 500 at Pocono Raceway. Rounding the 2.5-mile oval in 52.309 seconds, the #20 Toyota grabbed the pole position from the #56 Toyota driven by Martin Truex Jr. Logano's top time would hold up against the effort mounted by Kasey Kahne #4 Red Bull Toyota for the time trial triumph. With Joey Logano's name mixed in the NASCAR Sprint cup Silly Season, the 21-year old driver of the #20 Home Depot Toyota is looking to renovate his season with a top finish. Prior to this week, the strongest rumours had current NASCAR Sprint Cup Series point leader Carl Edwards signing to drive the #20 for 2012. As Edwards and Roush Fenway Racing announced a multi-year deal on Thursday, Logano's role in the Joe Gibbs Racing team has gained some security. After a Toyota Camry sweep of the top-three for the Good Sam RV Insurance 500, the resigned Carl Edwards sailed his #99 Ford Fusion to a 4th place at Pocono Raceway. In the June Pocono event, the #99 Roush Fenway Racing team lost their considerable lead in the series points due to a mechanical problem costing the team several laps in the event. Kurt Busch's #22 Dodge and the #11 Toyota of Denny Hamlin will start from the third row at Pocono. The fourth row will be an all-Richard Childress Racing pairing with recent Indianapolis Motor Speedway Brickyard 400 winner Paul Menard having position over Jeff Burton. Greg Biffle and Kevin Harvick completes the top-10 for Sunday's race.